It’s time to fire up that grill! 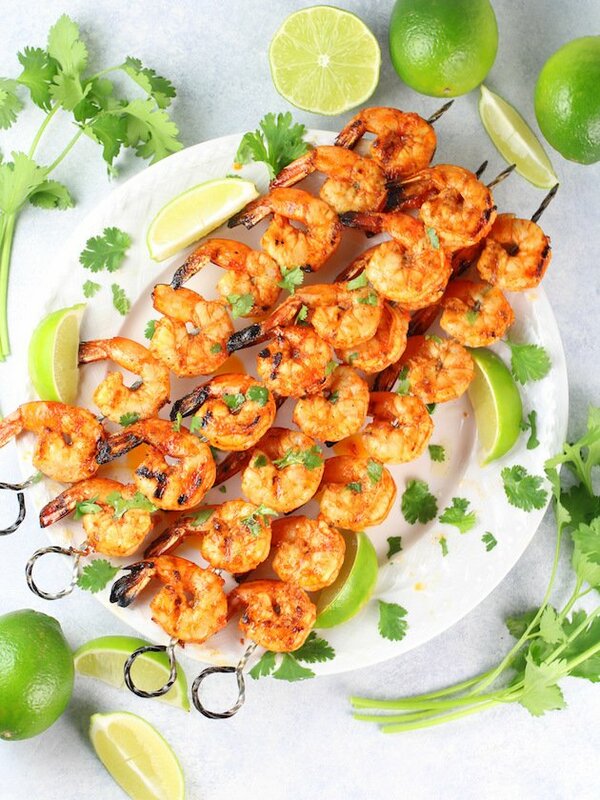 These Grilled Chili Lime Shrimp are quick, easy and the most delicious summer cookout recipe! 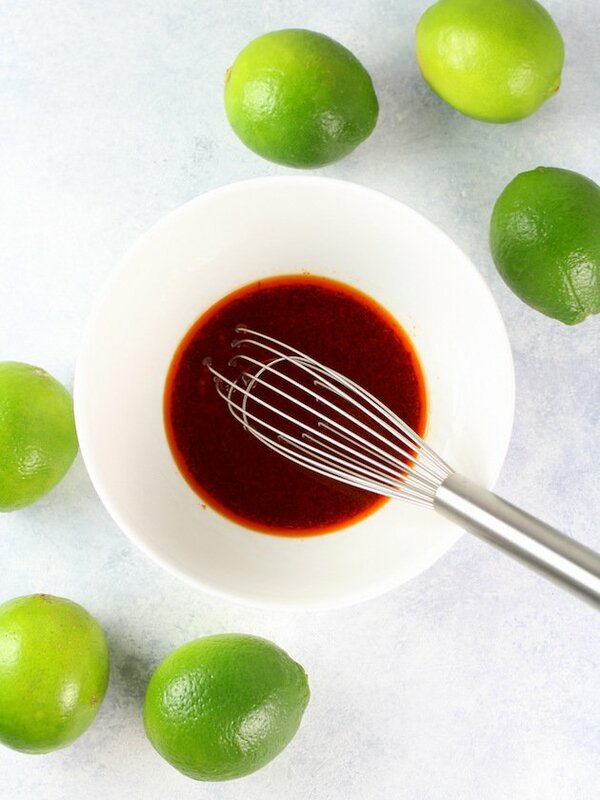 Marinated in smoked paprika, chili powder, fresh minced garlic, lime juice, salt and pepper, olive oil, and honey (or pure maple syrup)… The perfect balance of smoky, sweet and citrus that creates a zesty and mouth-watering flavor combination! I hope you’re enjoying some nice sunny weather where you live! I know it’s technically still spring but it sure feels like summer. Of course, I live in Florida so everyday feels like summer here. Well, except for the last several weeks. I think’s it’s rained all day every day for the last three weeks straight. Ok, so I might be exaggerating – there may have been 3 days that it only rained half of the day. Seriously. I think it had something to do with tropical depression Alberto and hurricane season starting up. This will be our first full summer in Florida so I’m not sure exactly what to expect. I think it’s safe to say it will be hot, humid and sunny. But that’s ok because I do love warm weather, sunshine, and all that goes with it. You know the drill: picnics, BBQ’s, beach days… basically lots of grillin’ and chillin’!! You gotta’ love grilling season – amiright? 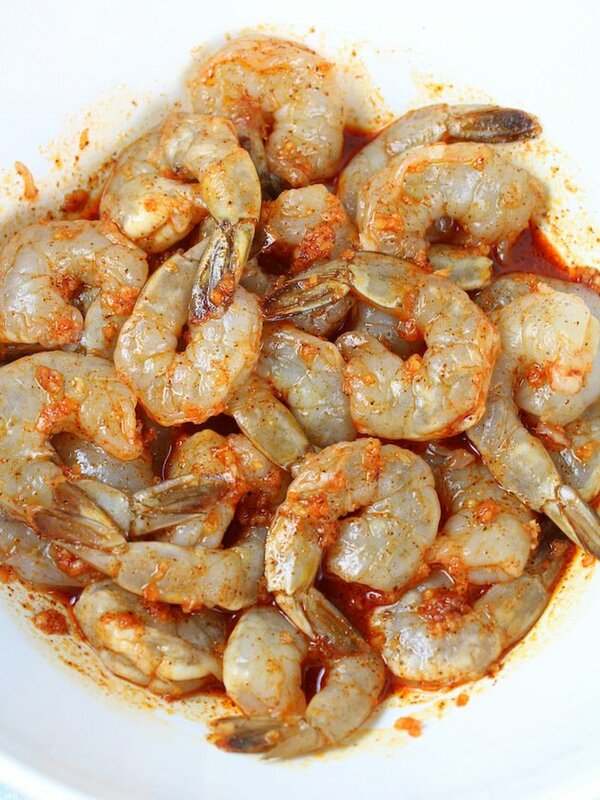 Chili Lime Shrimp: your new favorite shrimp recipe! I’m not sure why food cooked on the grill always tastes so much better, but it sure does. There’s just something about those grill marks that makes everything soo good! 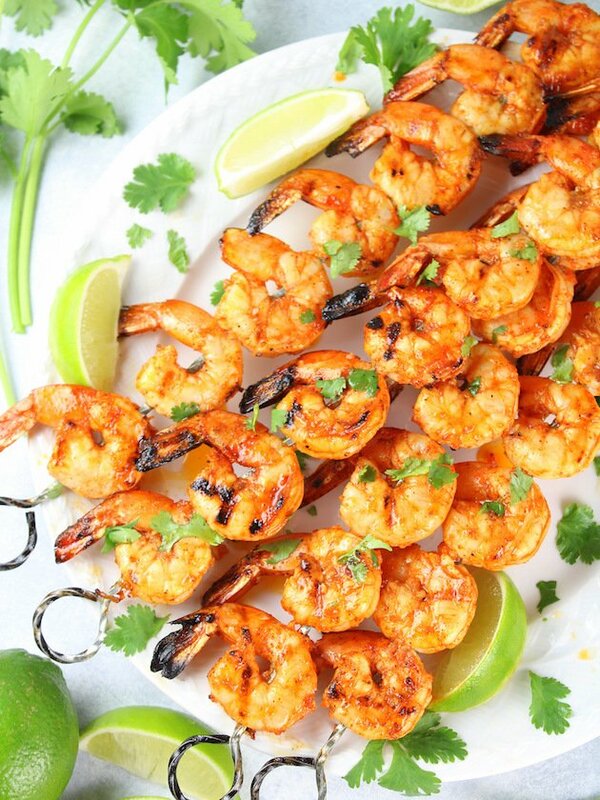 Like for example these Grilled Chili Lime Shrimp! Ahhh-mazing! Plus, they’re so easy – just marinade for 15-20 minutes and grill for 2-3 minutes a side. Whip up some Jalapeño Corn Salad or Broccoli Salad with Bacon and Grapes and boom – dinner is served. So effortless and just so tasty! I think you’re gonna love them! Annd if you’re one of those people who doesn’t really share my affinity for grilling, or maybe it’s been raining for the last three weeks – never fear you can always sauté these shrimp in a skillet on the stove. You gotta love options people! 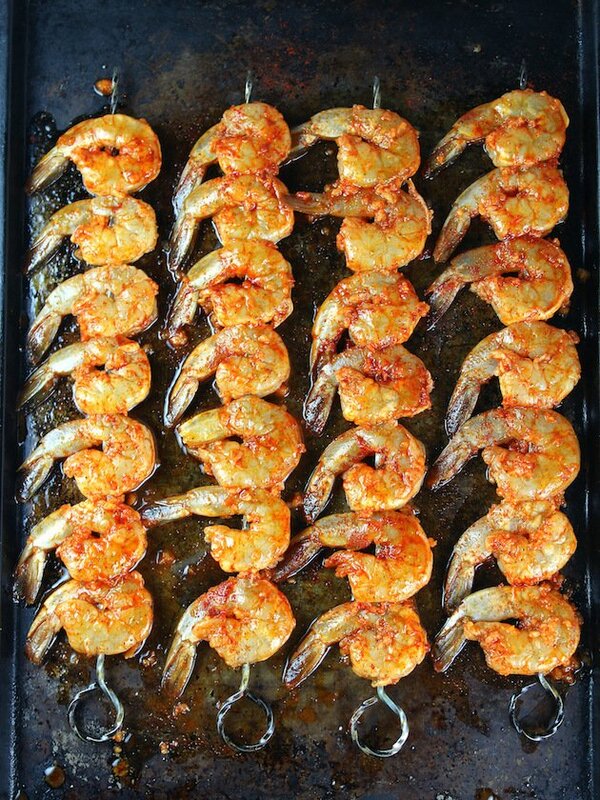 In my opinion, this is one of the best grilled shrimp recipes. I’m pretty sure it has to do with this delectable shrimp marinade. It’s made up of smoked paprika, chili powder, fresh minced garlic, lime juice, salt and pepper, olive oil, and honey (or pure maple syrup). The balance of smoky, sweet and citrus creates is perfect for this grilled shrimp marinade. 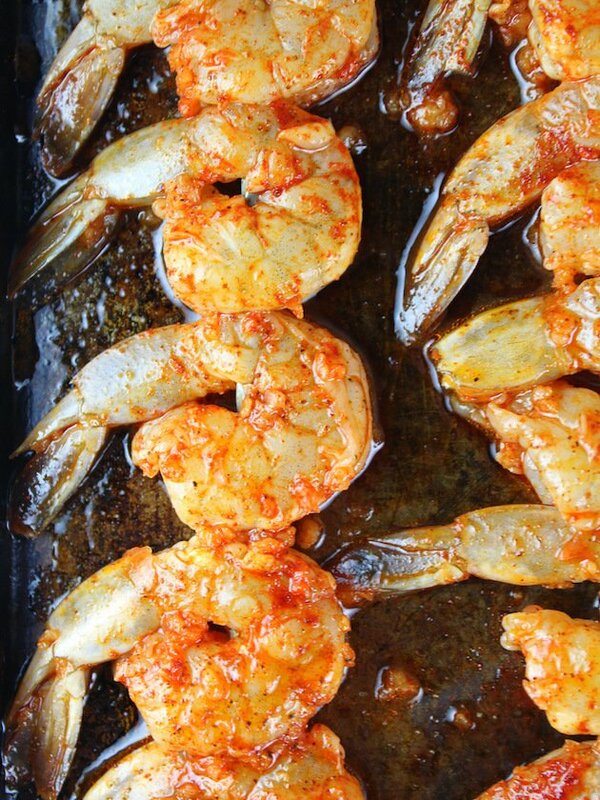 Just 15-20 minutes in the sauce and these shrimpies are good to go and ready for the grill. For this recipe I used medium size 26/30 shrimp (which means at this size there are 26-30 shrimp in a pound.) So, to ensure they didn’t fall through the grill grates I skewered them on metal skewers. You can also use wooden skewers, just be sure to soak them in water for a few hours before using so they don’t catch on fire. You could also use a grill basket instead of skewering… this is a good option when you’re in a hurry and want to cut down on prep time. Shrimp should be grilled hot and fast. 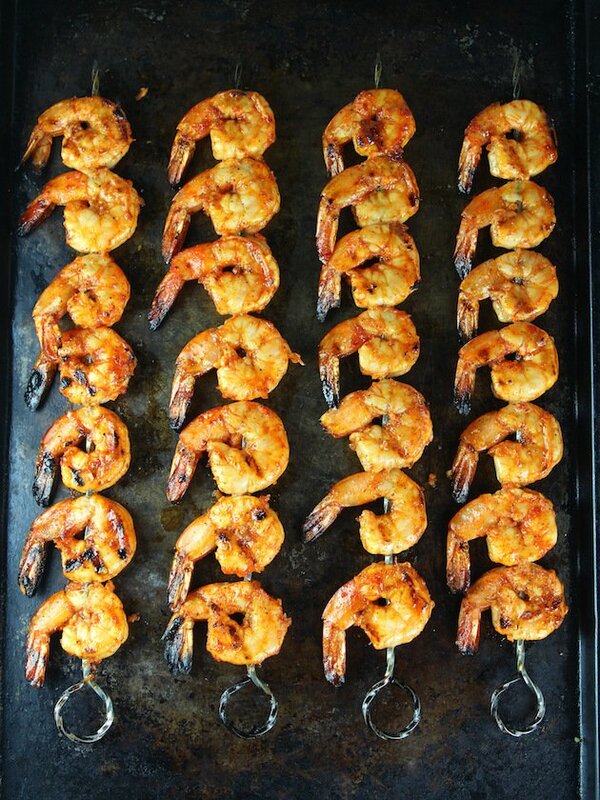 Make sure your grill comes up to high and then grill the shrimp 2-3 minutes a side. When the shrimp turn an opaque pinkish color on both sides, they are cooked. Once they’re grilled it’s time to serve them up. 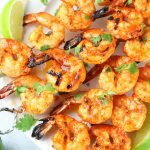 These Grilled Chili Lime Shrimp are so versatile and can be served so many ways. Or just squeeze a little lime juice on them and eat them straight up – my personal favorite! However you decide to serve these Grilled Chili Lime Shrimp – one thing is for sure, they will ALL be devoured. I think you’re gonna love this quick, easy and delicious recipe – perfect for summah-time living! They take on the flavor of spices and marinades really quickly. They cook really fast – so they make a great easy weeknight dinner. They are affordable – especially if you get them with the tail and shell on. Shrimp is a great source of protein – literally 90% of calories in shrimp come from protein. They are also really low in calories – only 84 calories in a 3-ounce serving. They are full of 20 different vitamins and minerals. Shrimp are a good source of omega-6 and omega-3 fatty acids. Pro Tip: Always buy wild shrimp, or buy farm-raised shrimp from the U.S. or other countries where antibiotic use in shrimp and shellfish is illegal. 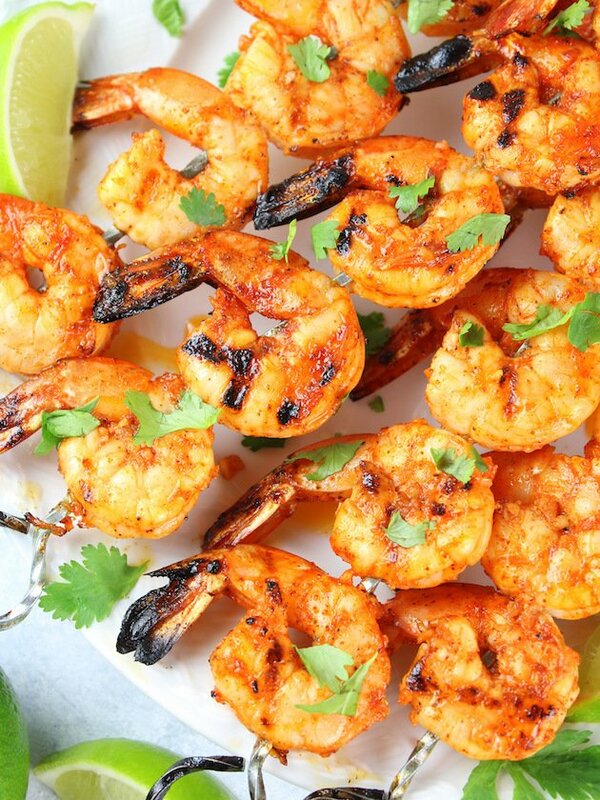 These Grilled Chili Lime Shrimp are quick, easy and the most delicious summer cookout recipe! Marinated in smoked paprika, chili powder, fresh minced garlic, lime juice, salt and pepper, olive oil, and honey (or pure maple syrup). Combine all ingredients in a large bowl and thoroughly cover shrimp. Cover bowl and marinate for 15 minutes. Turn grill to high and skewer the shrimp. 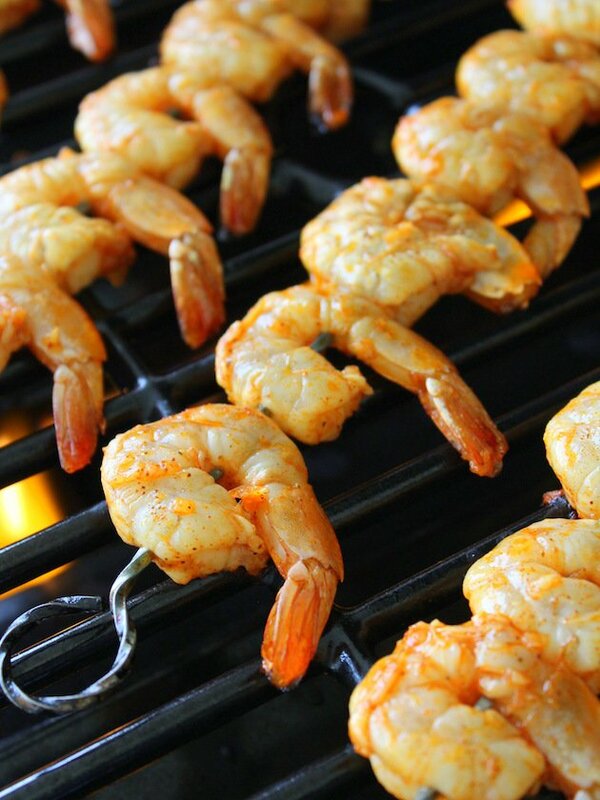 Ensure grill is fully heated to high temperature before grilling the shrimp. Grill the shrimp 2-3 minutes a side. When the shrimp turn an opaque pinkish color on both sides, they are cooked. For a kick of heat, add some cayenne to the marinade! More amazing, easy shrimp dishes! Definitely going to fire up the grill for this one. Chili and lime are my favorites with grilled shrimp. Looks great. Hi Mike! Thanks so much! I feel the same way. The flavors seem to pair perfectly together. Enjoy!